Justin: My name is Justin Chapple, and my new cookbook is called, Just Cook It! Suzy Chase: You graduated from the French Culinary Institute, then you went on to become the Deputy Test Kitchen Editor at Food and Wine Magazine, in addition to being the host of Mad Genius Tips, your James Beard nominated video series. What does a Deputy Test Kitchen Editor do? That sounds so official. Justin: Believe it or not, it's actually a little more official because I was recently promoted to Culinary Director of Food and Wine. Suzy Chase: Oh, well look at that. Justin: Basically what it means is, I get to cook, and I get to eat all the time, but most importantly I get to develop recipes and food content for everyday people, which is really what I love about my job. Suzy Chase: Basically, the home cook, me? Justin: Yeah, exactly. Basically what I do is ... I've been at Food and Wine for over eight years, and in that time I've had various roles, but the thing that I like to say is my favorite part of my job is I basically translate difficult recipes for the home cook. I've spent so many years testing recipes from famous chefs, or even chefs that really nobody knows about yet, but who would like to run recipes in Food and Wine Magazine. Basically it's been my job for so long to look at the recipes and streamline them, maybe reduce the number of ingredients, simplify the technique so that it's something that is really approachable. Then, I basically redo the recipe, still keeping in mind the chef's vision, and just make it so much easier for the home cook. Justin: When I started writing this book, I thought to myself well, how can I do something that not only has my point of view, rather than so many of the great chefs that I work with, but that teaches people all of the things that I've learned along the way? That's what I've done in, Just Cook It. Suzy Chase: It struck me by how many different types of cuisines are in this cookbook, but it's not discombobulated. It all works together. Is this how you cook at home? Justin: Yeah, it really is how I cook at home. A lot of that is just because over the years I was cooking food from so many different people, I've learned so much about different cuisines. When I started writing down and figuring out what I wanted to put in the book, I thought, okay, well what type of cuisine should it be? Should it be American? Should it be Italian? Should it be French, which is what I'm trained in? But then I thought to myself, I should actually really put all the different types of recipes and cuisines that I cook at home, because I cook very globally. That said, none of the recipes are truly authentic. They're really inspired by a region, or a type of cuisine, or a recipe that I've had at some point. Then I've reinvented it with my own perspective. I think it worked out well. Suzy Chase: I do too. I live for nostalgia, just like you. I'm dying to hear about Grandma Barbara. Justin: Oh, Grandma Barbara, she was my savior, really. She's really the first person who introduced me to home cooking. Part of how she did that was she plopped me down on sofa next to her. She'd say, we're going to watch these shows. We'd watch Yan Can Cook, and we'd watch The Two Fat Ladies, Jacques Pepin, Julia Child. This was before food television was really what it is today. This is back when most of the time when you watched cooking shows, it was on PBS. I love it. I fell in love with it. I remember as a kid I used to say, I want to be a chef. Or at that time, I probably said cook. She encouraged me. She would teach me, started out simple, she would show me how to make tuna salad. One of the most advanced things that she taught me as a kid was how to poach eggs. Of course, I think my poached eggs have come very long way now, compared to the watery mess they were when I was a kid. Justin: She just taught me so much. What I think is so amazing when I look back is, how much she taught me that she doesn't realize, because we didn't grow up with a lot of money, and we didn't have a lot of resources. We didn't have a lot of fancy kitchen equipment. Still, every day she made incredible meals that were so inspiring. Throughout the book, I've taken some of the things that I learned from her and I've made them a little more modern, maybe changed a few ingredients here and there, but really tried to achieve what I remember having as a kid. Justin: A couple of examples are that are my bacon and egg ramen, because growing up she used to take little packaged ramen noodles and she'd put them in the microwave with an egg, some scallions, and maybe a little chicken broth. It ended up becoming something that was totally different than what you think of when you think of packaged ramen. I tried to recreate that in my book. I think I did pretty well. I think she'd be happy with it. Suzy Chase: In the cookbook you wrote, don't tell anyone, but I might have been a little bit dorky as a kid. Not that I've changed much. I was freckly and quirky with all sorts of big bizarre dreams. I would read cookbooks and food magazines, watch Two Fat Ladies, and Yan Can Cook, and fantasize about becoming a chef. What advice would adult chef Justin, tell young, quirky Justin? Justin: Actually, that's a really good question. I'm glad you asked, because I recently was able to speak to this high school culinary program. They had asked me to come. It was actually my high school which since I left they drew out this incredible culinary program for high school students. They asked me to come back and speak to the kids, and I did. One of the things I told them was, don't let anyone tell you that going to trade school or vocational school is a bad thing. Because when I was growing up, you were strongly encouraged to go off to a four year university. I went off to school, yet all I really wanted to do was cook. In our industry we call ourselves career changers, because I had established myself as an adult before I decided to go to culinary school. Then one day I said, you know what? I've always wanted to cook. I still want to cook. I'm going to cook. So I went to culinary school. That was almost 10 years ago. Suzy Chase: I've talked to quite a few cookbook authors who were unfulfilled by working in a professional kitchen because the personal link to the customer was missing. Talk about your connection between the food and the people you make food for. Justin: Well, that's exactly right. When I worked in restaurants, you cook all day. But I was in fine dining, and so you're really kept in the back. You're kept in the kitchen. You don't really get to see reactions. You don't get to see if people are enjoying it. You don't get to hear the feedback of whether or not they want something different. But since I've been at Food and Wine, and I've been creating recipes for the masses, for lack of a better way of describing it, especially nowadays with social media, I get so much feedback. I hear what people want. I hear the types of foods people want to eat, and the types of food people would like to prepare at home. I change what I do based on that. It's what I love about what I do now, is that I get to interact with the people who are actually cooking my food, or the people that I'm cooking for. Justin: When I developed the list of recipes that I was going to put in the book, I really considered all the things I've heard over the years, all the favorite dishes that people like to make at home, all of the types of foods that they'd like to learn more about, which is why, if you go through the pages of Just Cook It, you'll see a lot of vegetable recipes. Because more recently, people are just obsessed with vegetables. They're obsessed with side dishes. That's one of the things I really focused on when I wrote this book, was providing all the different types of vegetables. Some of them are more involved than others, but for the most part they're all super, super easy, really approachable, and they teach you to use ingredients in fun new ways. Suzy Chase: You have a must-have equipment section in the cookbook. One of your must-haves is a cast iron pan. As a New York City apartment dweller, I wish I could grill. How do you grill indoors? Justin: It's really hard, because I also live in New York City, and I have a small apartment, so it's really hard to grill indoors, but I like to use a grill pan. Rather than getting it as hot as possible, if you just reduce the temperature just a little bit, you are better off with the fear of setting off your smoke alarm. Suzy Chase: I've heard you say hacks are one thing, and shortcuts are another. What's the difference? Justin: I get asked that question a lot, because I do have the video series through Food and Wine, which is called, Mad Genius Tips. It's all about food hacks. It's all about finding really bizarre ways of creating a shortcut. Technically a hack is a shortcut, but nowadays the term hack has really become a term for shortcut when the shortcut is really outrageous. Whereas a shortcut is just a smart, often times professional way of making something easier. Throughout my book you will find a few hacks here and there, but for the most part I wanted to include just a ton of shortcuts so that people wouldn't be intimidated, so people weren't afraid to get in the kitchen, so that you can make all the things that you perhaps thought you could never make. Justin: Just for an example, I have my new school beef bourguignon, which is really inspired by a classic beef bourguignon, which if you're not aware of what it is, it's a beef stew made with red wine, probably made famous by Julia Child. In order to make it at home you'd normally dry all your meat and then you cook it in three or four batches in your big pot. Then you have to brown all your vegetables separately. Then you have to braise your meat separately. At the end you put it all together. Justin: But really, I've streamlined the process by first, rather than cooking the meat in so many different batches, I dry it all and I spread it on a baking sheet. Then I broil it so you brown it all at once. Then I put that into the pan, into the pot with the red wine, and your aromatics, and then you braise the meat that way. Then of course rather than browning all your vegetables in different skillets, I add them all in. It's definitely a shortcut, and the recipe is definitely still delicious. I really think it's reinventing how a very classic French dish can be made at home. Suzy Chase: Another shortcut that caught my eye in, Just Cook It, is preserved lemons that can be made in 10 minutes on the stove. Describe that. Justin: I haven't yet been asked about that recipe, so I'm so glad that you did because it's really a brilliant cheater version of preserved lemons. Preserved lemons are lemons that have been salted and basically cured for upwards of a month. They have an incredible, incredible, deep very floral flavor. You don't actually use the flesh of the fruit. Some people do. They like to spread it on toast, or they like to stir it into stews. But for the most part when we talk about using preserved lemon, we talk about just using the rind, because the rind gets really soft once it's been cured. It mellows out and you can actually just eat it, but it's still intense. But, it's used as a condiment, so you can put it into vinaigrette. You can put it into aioli’s. You can put it into a stew, or into a chicken braise, or something like that. Justin: You can buy them in the store. That's definitely something that you can find pretty much at most stores nowadays, but I developed this trick for doing it at home. It's a shortcut that I think is really phenomenal. When you want to use preserved lemons in a pinch, and really what you do is you scrub the lemons and cut them into wedges. Then you cook them in a saucepan with just water, and salt. What it does is it softens the rind, much like the month long curing process would, and with the amount of salt that I use ... Which I think I use three or four tablespoons in the recipe. It gives it that kind of flavor that you would get from the salt curing process. Justin: In my opinion, it's such a smart shortcut for something that could take upwards of a month. Now you can do it at home in really 10 minutes. The best part is once you make them, because they're technically salted still, they can be in the refrigerator for six months. You can do a double or triple batch. Cook them in 10 minutes. Put them into a jar or container, like a plastic container with a lid, put it in the back of the refrigerator, and they'll be there for six months. Every time you need a little, you just take it out, you chop it up, and it's ready to go. Suzy Chase: One thing I hate to do is cut up cucumber. I can never make perfectly diced cukes. Thank you for telling us to smash our cucumber. Talk about that. Justin: That is probably one of my favorite techniques in the whole entire book. Throughout the book you'll find little things like that, like little ideas that don't require more effort. They often times require less effort, but huge reward. That's what smashing the cucumbers is for me. Because what I do is I basically put the cucumbers onto a cutting board. I like to use Persian cucumbers, because I love their really, really, really crisp texture, and the fact that they have very little seeds. You can find them pretty much everywhere now. They're the perfect snackable cucumber. Justin: I basically put it flat on a work surface. I put my knife flat on top of that, with the blade facing away from me. Then I just use my palm, and I just smash them. Then I tear them into pieces. What's so great about that is because the crushed cucumber has all these nooks and crannies now, it absorbed the dressing so much better than if you just sliced them or chopped them, and it makes it more fun to eat. Suzy Chase: That is so smart. That's totally a game changer. Justin: It's 100% a game changer. The salad that goes with it, in my book, Just Cook It, is so simple. It's an Asian inspired salad with just a couple ingredients, and then some herbs which are optional. I just think it's the perfect recipe for now. Suzy Chase: The stew was so different and delicious. How did that recipe come about? Justin: That recipe came about because I'm a little bit of an addict when it comes to buying frozen dumplings, and frozen raviolis, and stuff like that from the store, because living in New York City, I work until 06:00, and often times the only time I have people over, it'll be on a weeknight. I tend to like shortcuts like prepared raviolis and prepared pot stickers, in this case, shumai. I had bought some shumai from a corner store. Here in New York we call them bodegas. Because I was just craving some little dumplings. I think I remember the ones that I bought, they weren't that great. I ate them, but I had some leftover in the fridge, and I said to myself, how can I use theses up? So I made a stew out of them. It was such a weird, happy accident, because what I really did was just sauteed a little aromatics, like ginger and shallots and garlic, threw in some chicken broth, added the shumai, added some greens, and it became this really hardy Asian inspired dumpling stew that now I make it all the time. Suzy Chase: Oh my God. I've never seen anything like it. Justin: This too, in my opinion, is a game changer because it really shows you a new way of using something. You go to the supermarket. They always have that section of frozen pot stickers, and frozen dumplings. They even have often times the frozen udon noodles in the same area. Those ingredients, believe it or not, you don't have to use them in the traditional way. You can reinvent the way you cook at home very easily. That's what I really wanted to show in this book, was how with just a couple smart ideas, you can change the way you cook forever. That's why I like to say this shumai stew is a game changer as well, because it teaches you something simple like putting those frozen dumplings into a soup. Justin: It's something that you'll walk away from the book with and you'll do it. You might not follow the recipe next time. You might do something else. You might say, well okay, I don't have mustard greens, or I don't have shiitake mushrooms on hand, so what can I do? Maybe you take those shumai dumplings and you do an Italian inspired soup with tomato, and basil, and with your dumplings in there. Because you're using them as a condiment. You're using them as an ingredient as opposed to making them the focal point. Suzy Chase: Here's my problem with the Trader Joe's frozen shumai, is that when I steam them, they get crunchy around the edges. I've decided to never buy those again, but I used them for the shumai stew, and in the stew the shumai stays moist. It doesn't get that weird crunch on the edges. Justin: Right. That's true for a lot of frozen ingredients. Because they get a little frostbitten, and then they start to dry out. That's a really good point. Because they're in the stew, they're going to absorb all that delicious broth and just get really nice and tender and juicy. Suzy Chase: With the peel and eat shrimp, I never knew that if you cooked them in the shell, they stayed juicy and tender. The green chili butter on the shrimp was so luxurious. Justin: That green chili butter, which I sometimes I use jalapeno, other times I use the serranos. It's such a smart secret weapon. It really is, because what I do is sometimes when I make that recipe ... So, for those of you listening, basically my peel and eat shrimp has two really, really smart tips to it. The first one is to cook your shrimps in the shell, because they stay really moist and tender, and you don't overcook them. What I like to do is take little scissors and then I just cut down the back, which not only allows you to remove the vein, but it exposes the meat so that you can spread it with this chili butter. That's the first tip. Justin: The second tip in this recipe, which is a secret weapon in my opinion, is making this green chili butter. You just mash butter with chilies. Like I said, I use jalapeno, or I use serrano, some chives, some lemon zest, and then just salt and pepper. That's it. You blend it in a bowl with a fork, and then you spread it on the meat under the shell of the shrimp. Then you chill the shrimp, and then when you roast them in the oven, they get perfectly cooked and the chili butter is just the little kick that you want, because it doesn't overwhelm the shrimp. But, it makes them even more juicy and more tender. Justin: But the reason I say that green chili butter is a secret weapon is because sometimes I make a double or quadruple batch. And then I use some for the shrimp, and then save the other for anything I want. Sometimes I toss it just on boiled noodles. Sometimes I just put a little pat of it on top of the grilled steak. Sometimes I spread it on top of a grilled, or roasted piece of skinless chicken breast. It just adds this little bit of oomph that you're looking for something that's really simple at home. Suzy Chase: I used jalapenos and I was a little worried because I was feeding my 11 year old. I'm like, just eat the shrimp. I was standing back watching him. But it doesn't absorb the heat. It just had the flavor of the jalapeno. Justin: Right. That's because to make the butter, you first seed the chilies. You seed them and then you mince them, and so because you're removing the seeds and the ribs, that's where all the heat is in the chili. You're really just using the pepper itself. The pepper, sometimes they can be hot, but I have a really smart trick for knowing whether or not a chili is going to be really spicy. We've all been there where a recipe calls for one or two peppers, and you can choose. You never know how much to use because you're not sure how hot they are unless you taste one. Justin: But, I actually learned this trick from my friend Melissa Clark who works for the New York Times. She said, what you do is you cut the jalapeno or the chili in half, and then you smell it. If it smells like a bell pepper, then it's sweeter. But if it smells really spicy then you know it's going to be a really hot chili, and you should maybe start with less before you add more. She taught me that, and I was like, why have I not ever known that? It's such a brilliant trick. Suzy Chase: Right. Well, thank you Melissa Clark. Justin: Yes. So smart. Now I do this. I wish I had known that right before I did the book, because I would have put it on every recipe that has a hot pepper in it. Justin: Well, you can find me all over social media and on the web at, Justin Chapple, just my full name. My last name is spelled C-H-A-P-P-L-E. I really do hope that people reach out, because I'm really responsive on social media and on the internet, just because I love talking with the people that are making my recipes and eating my food. It's one of my biggest pleasures in life. Suzy Chase: Well, I will echo what Valerie Bertinelli said, this is for all of us home cooks who want to up our game in the kitchen. Thanks Justin, for coming on Cookery by the Book Podcast. Justin: Thank you so much. 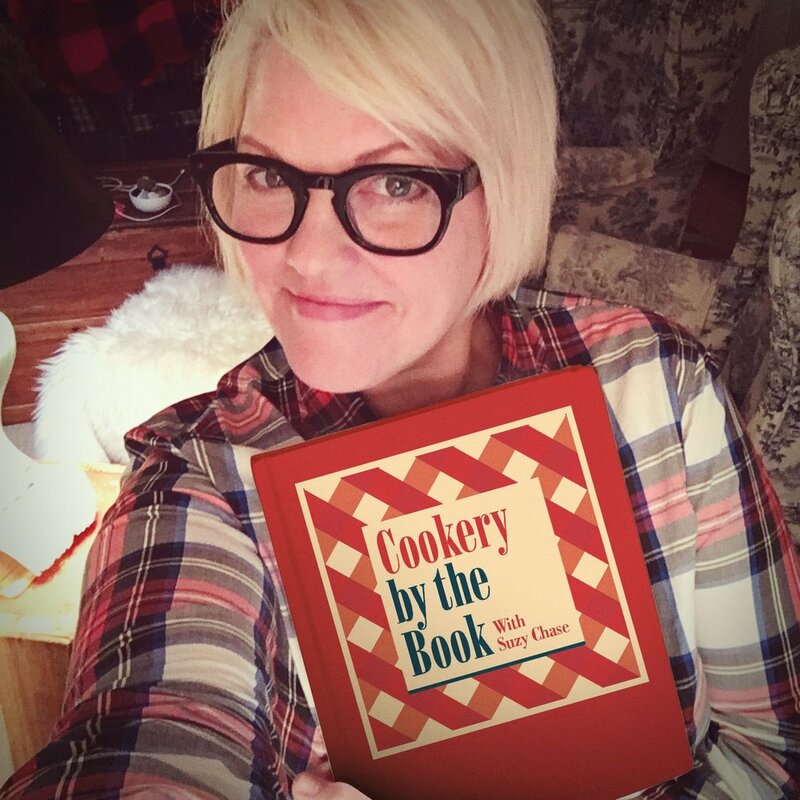 Suzy Chase: Subscribe in Apple Podcasts and while you're there, please take a moment to rate and review, Cookery by the Book. You can also follow me on Instagram, @Cookerybythebook. Twitter is IamSuzyChase, and download your Kitchen Mix Tapes. music to cook by on Spotify at Cookery by the Book. Thanks for listening.